By now, you’re well into fall mode with a regular routine and weekly commitments. Activities and routine can be great, but sometimes things can crowd out your commitment to regular read-aloud time. If you’ve lost some of that reading momentum left over from the Summer Reading Bucket List, then we’ve got you covered with ideas to renew it this season. We like to keep it simple around here. And we know you don’t need one more piece of paper to keep track of this school year. You want to do more than survive the fall. You want to thrive. 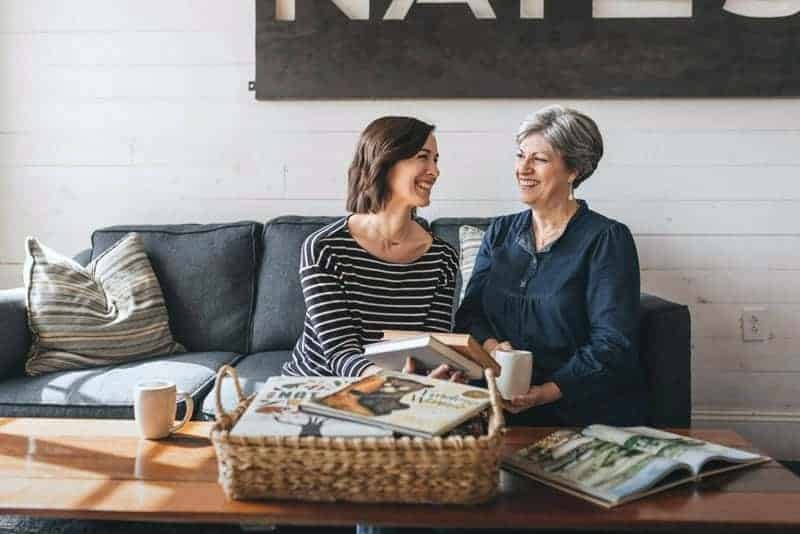 You want to make time to connect as a family and spark a love of reading in your home. We’ve got you covered with something simple. Yes, it’s a piece of paper. But we promise it’s full of potential. This is not a checklist of shoulds. It’s inspiration for some family reading fun. 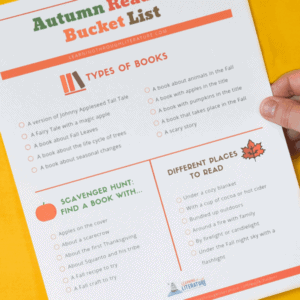 The Autumn Reading Bucket List is nice and simple. We chose only a handful of suggestions for each category. With these ideas, you’ll have a few simple, attainable goals to kickstart your family’s fall reading. It can be a reminder to set aside read-aloud time, which we know you already want. The list is fairly short, totally do-able, and won’t take you until the new year to complete. Print it, tape it up, and get that easy win. We suggest completing this one together as a family. The summer is a great time to encourage independent readers to try new books on their own. However, this busy season is the perfect time to gather everyone together for a family activity. The bucket list is broken into a few sections for simpler goal setting. Here’s what you’ll find. Types of books to read. Sometimes we need a nudge to pick up a book at the library or from our own bookshelves. 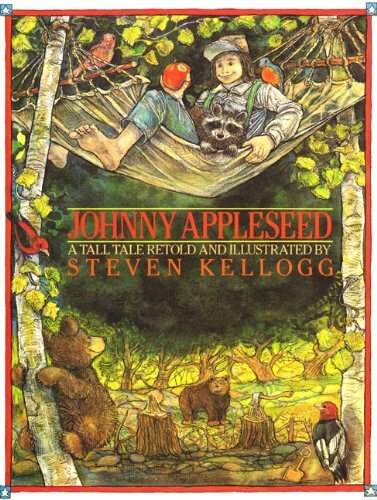 Got a book about apples? Or one about the life cycle of trees? Read it. Check it off. Places to read. Take books outside with a blanket. Read around a campfire. You get the idea. Encourage kids that reading can be done anywhere. As they say, books are portable magic. Book Scavenger Hunt. This is where easy crossover happens and multiple boxes can be checked. A type of book you choose from the first section might have a character type listed on the book scavenger hunt. Win, win. 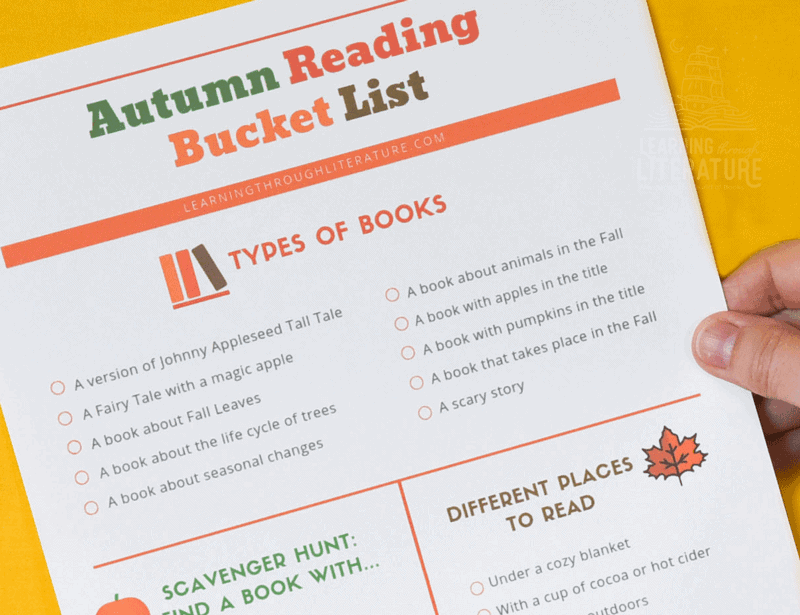 Get Your Autumn Reading Bucket List Below! 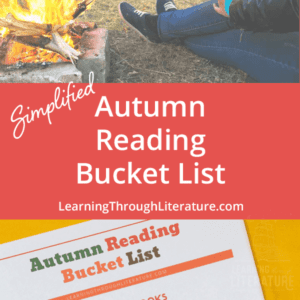 In order to get the FREE Autumn Reading Bucket List you must enter your email address using the leafy form below, click subscribe, and then check your inbox. Once confirmed in your inbox, the PDF should immediately download. Be ahead of the game. When every single book is an option in the children’s section of the library, everyone feels overwhelmed. Use the Book Finder to quickly search for options like Seasons or Thanksgiving to make a quick list of books for the next library trip. Or maybe let your kids try out the Book Finder filters to find a few that spark their interest. Here’s a quick video to see how fast and easy it is to filter and generate a book list. We’re all for kids reading outside of age recommendations when it’s appropriate. A great book a little below their level can do more for reading enjoyment than any ol’ book on the shelf with their age listed on it. A great book is always a better choice. Have a variety of books to accomplish more in a shorter time. Read a stack of picture books to check off some boxes, and read aloud from a longer chapter book to complete a few others. Apples in the the title…check. Read it in under a cozy blanket with a cup of cocoa…check, check. 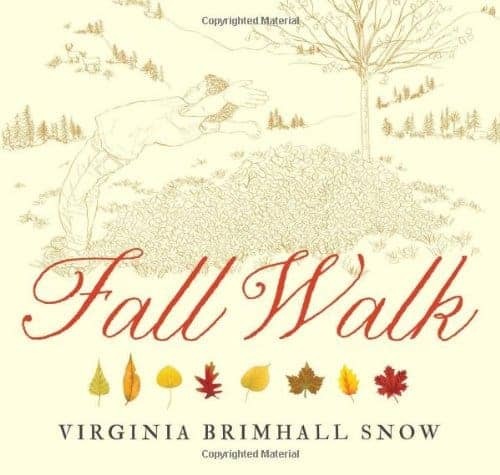 Or maybe you get the picture book Fall Walk about fall leaves. Book that takes place in the fall…check. Read it bundled up outdoors…check. A few minutes of printing and planning is all it takes. Now you have a direction for your family’s fall reading. Bottom Line: You’re going to connect as a family, accomplish this list, and spark renewed interest in reading this fall. P.S. 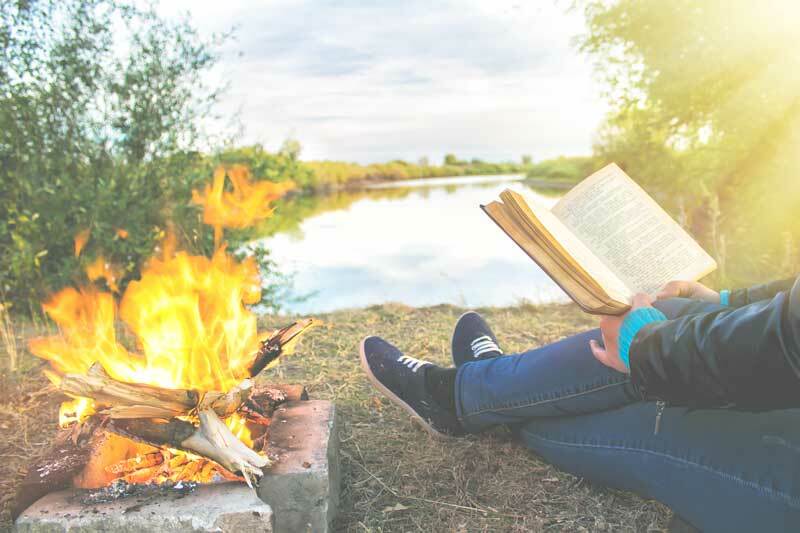 – If you’re one of our wonderful readers living in the Southern Hemisphere, check out our simplified summer reading bucket list for your current season!